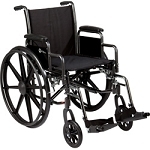 The Roscoe K4-Lite Wheelchair is a high-strength lightweight chair with an attractive silver vein powder-coated steel frame. 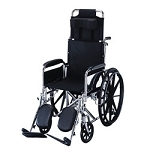 It features flip back arms allowing for easy patient transfer. 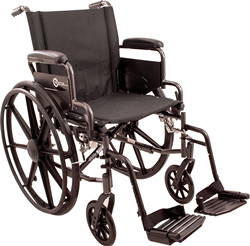 Designed with a dual axle and multi-position caster forks, our K4-Lite chair provides for easy transition of seat height to hemi level. Comfortable padded nylon upholstery resists mildew and bacteria. Chart pocket on backrest and industry compatible front riggings come standard.